Just as companies have been treating wealthy customers, or customers who are more likely to spend more with preferential treatment, there’s no surprise that some companies plan to segment customers based by influence. As more consumer data appears in social media channels, relying on influence metrics like Twitter followers to blog readers will help companies identify those that can hurt or help the brand on a grander scale. As a result, companies naturally will seek a standard measurement for measuring influence. Klout, is starting to integrate into many digital touchpoints. From hotels in Vegas offering special services to those with high scores, to a growing range of services that Klout is integrating with, and even politicians, the service is starting to grow. In fact, I just learned that social integration and curation vendor Echo is already helping some clients sort which content appears on the corporate website based on their Klout score, see their documentation to learn more. Just last week, we learned that Klout is starting to integrate their service right into Twitter.com using browser extensions. In fact, this interesting case study below shows that Kenneth Cole’s Klout influence increased significantly during the Twitter debacle, as Klout fails to take into account sentiment measurement –just raw reactions and network growth. See this image and read my additional comments on the photo. 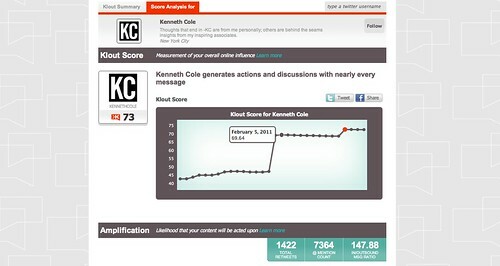 Above Image: Kenneth Cole’s Klout score ascends nearly 30 points during his self-inflicted PR disaster. Alienating your mainstream customers in desire to serve influentials. Careful when using Klout to segment customers priority, while high scoring Klout users may appreciate the ego boost –anyone with less than the ideal number of points may quickly fall out of love with your brand if you display elitist behavior. No one likes a ‘better than thou’ unless they are the ‘thou’. Consumers will game the system –reducing validity of metric. Expect many people to start gaming the Klout systems, in fact I see some ‘influential types’ tweeting over 200 times a day to try to hopefully raise their Klout scores, which just ends up annoying their followers. Klout is not representative of a customers real influence. Currently, as I understand it, Klout only siphons in content from Twitter and Facebook if the user allows for FB connect. Without sentiment of the influencer –the gauge is incomplete. Klout lacks sentiment analysis, so true opinions of what’s being said about the person may be ill-informed, see Kenneth Cole example above. Relying on this single metric alone is dangerous. as Frank Eliason of Citi (formerly Comcast Cares) indicates the “sleeping comcast technician” was uploaded by someone who had practically zero prior online influence. Influence is not a gauge of true buying potential. Perhaps the most important point is that influence scores don’t necessarily impact the revenue or customer satisfaction of your brand to your core set of customers. While we trust Scoble for technology choices, relying on him for the latest in landscaping design may be a mis direction worth avoiding. Recommendations: Brands Must Factor in Relative Influence –not just Absolute Influence. The folks at Klout have done a good service to the industry, but I must warn against blind enthusiasm to note that a single metric is not sufficient. In fact, a single metric, like Klout’s 100 point scoring system applies well for Absolute influence (global influence) it’s unable to provide Relative influence, or influence related to a specific market, like baby diapers. For example, Ashton Kutcher who has very high absolute influence, has relatively low influence when it comes to bio-engineering or pottery arts. As a result, brands need to recognize there are more than one type of influence required. As a customer strategist you must factor in both forms of influence before making a decision. Learn more about the various types of influence, NPS, and what the ideal metric would look like Remember, there is NO “Standard for Influence” –every market is different. I look forward to the comments below: How should companies gauge influence? Also, see the SCRM pioneers thread on this topic. Update: Joe Fernandez, the CEO of Klout left a comment, kindly read.